The Dane family's roots tangle deep in the Ozark Mountain town of Henbane, but that doesn't keep sixteen-year-old Lucy Dane from being treated like an outsider. Folks still whisper about her mother, a bewitching young stranger who inspired local myths when she vanished years ago. When one of Lucy's few friends, slow-minded Cheri, is found murdered, Lucy feels haunted by the two lost girls - the mother she never knew and the friend she couldn't protect. Everything changes when Lucy stumbles across Cheri's necklace in an abandoned trailer and finds herself drawn into a search for answers. What Lucy discovers makes it impossible to ignore the suspicion cast on her own kin. More alarming, she suspects Cheri's death could be linked to her mother's disappearance, and the connection between the two puts Lucy at risk of losing everything. 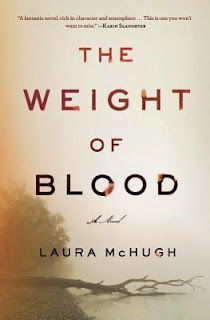 In a place where the bonds of blood weigh heavy, Lucy must decide where her allegiances lie. I almost don't want to start with writing because I'm afraid you'll take one look at my critiques and skip the next part where I talk about how much I enjoyed reading the book. So, heads up, I really enjoyed the book and will be talking about why in the next section. Sadly enough, I have some major complaints regarding the actual writing of the book. The symbolism is just so far over the top it's almost comical. It's an evil town with a dark secret - so of course it's named after a poisonous plant (discussed to death in case you are likely to forget) with all kinds of topographical features named after the devil (again, discussed to death). There are some enormous plot holes and issues with believability in the characters and their reactions to the shocking revelations (which I'll avoid spoiling). Suffice to say, horrible things are revealed and our main character, a seventeen year old girl, is less than phased. She's blase in the face of absolute horror, which I found hard to swallow. And finally, I found the portrayal of the small town to be beyond the realm of my imagination. Basically everyone in the town is just a horrible person, with the exception of our main character and her love interest. There's a big secret that basically every man in town seems to be in on and it's a doozy. I have a hard time believing that A) every man in town is vile and that B) in a town that is supposed to be so very small, none of the women have ever realized what's going on. All of that said, I still liked the book. It's a thriller, right? And a gritty thriller at that. I wasn't exactly looking for it to be believable, I was looking for it to have lots of twists and turns and moments that kept me on the edge of my seat. Of course it's ideal for a book to be both well-written and horrifying, but really I'm happy with any thriller that can keep me guessing. This one delivers on all of the thriller genre points I look for: interesting characters (not necessarily likable), twists and turns I didn't see coming, and pacing that keeps my interest. I also like a fair amount of grit in my thrillers and this certainly delivers in that area. While I don't think this one is destined for any of my "best of" lists, I'd still recommend it to fans of the genre, particularly those who share my fascination with small towns that hold dark secrets. I've mentioned grit a few times, and it's certainly here in spades, so be forewarned about potential offensive language as well as scenes of sexual violence.